just as objects, but also as persons. the tyranny of aesthetics[, though]. a dead “thing” separated from nature. to be nurtured in it. If only for a while it is/was real as could be, but it's honesty and fear that's getting me into knots. sings sad songs to this empty sky to take it away from here. Tell me you love me and let's fly away free. From a love-bird to a soul mate, it's all in a day. While the journal is dedicated to the writers who submit their work to us, here we'd like to show off a few pieces from our editors. Enjoy! 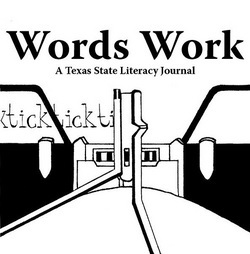 Words Work is the official publication of the Texas State University Writing Center. As an online literacy--as opposed to literary--journal, we are dedicated to showcasing the culturally rich literacy found on our campus. Though we can't publish everything, we don't distinguish between high- and low-brow anything. After all, language & online culture dsn't. Y shld publishers?